The Willamette Reed Trio is a chamber music ensemble based in the Portland, Oregon metropolitan area consisting of oboist Greg Ruetsch, clarinetist Lea Anne Bantsari, and bassoonist Gloria Benci Handy. We play a wide variety of music ranging from works written originally for reed trio, as well as arrangements of older works and contemporary pieces from many different genres. As advocates of reed trio chamber music, we provide our arrangements of public domain works free of charge (under the Resources tab). Mention of the oboe, clarinet, and bassoon in a chamber ensemble will usually bring into mind the wind quintet, which in additional to these three reeded instruments includes the flute and French horn. Relative to the wind quintet, which dates back to the late eighteenth century, the reed trio is a newcomer and came into prominence in the early twentieth century with the formation of the Trio d'Anches de Paris in 1927. In collaboration with the publisher Éditions de l'Oiseau-Lyre, works for the reed trio by composers such as Ibert, Milhaud, and Auric were commissioned and their publication included not only sheet music but recordings by the Trio d'Anches de Paris and other reed trios, a novel concept at the time. Sonically, the reed trio lies between the homogenous sound of the string quartet and the vastly different timbres of the wind quintet. The timbres of the oboe, clarinet, and bassoon strike a unique balance being both distinct and complimentary. As a part of Make Music Day PDX, the Willamette Reed Trio will be performing at St. Honoré Boulangerie, 3333 SE Division Street, Portland on Sunday June 24 from Noon-1pm. Make Music Day is a celebration of music that grew out of the Fête de la Musique which originated in France in 1982. 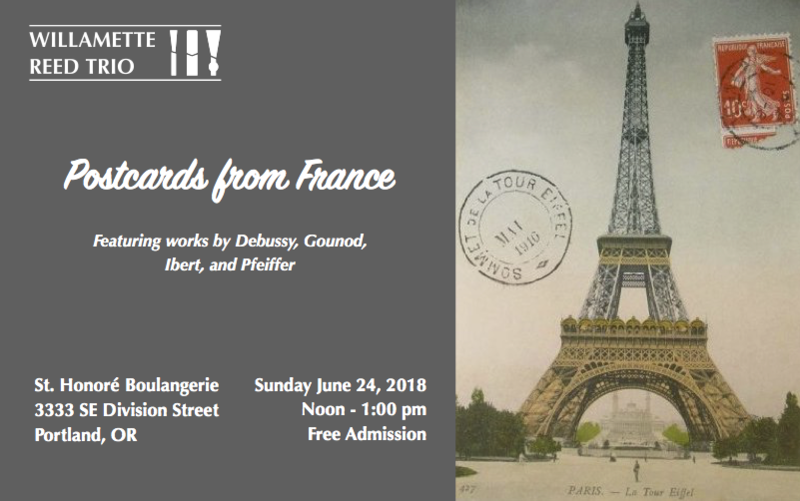 In honor of the French roots of this event, as well as the venue, we will be featuring works of French composers in our performance. There is no cover charge for this event. Below are some arrangements of public domain works in our repertory. The Tango in D is a movement from the suite España, originally written for piano. Both A and B♭ clarinet parts are available. From the Anna Magdalena Notebook, this is an arrangement of the second menuet of the first of the six French Suites written in or before 1722. The one-page score can be used by the musicians. Transcriptions of several of Bach's three-part inventions. Des pas sur la neige, or Footprints in the Snow, is the sixth work from Debussy's first book of Préludes. While three voices cannot capture the texture of the original piano work, the arrangement can, as directed by the composer, "evoke a sad and frozen landscape"
At only 36 measures in length, and to assist in collectively playing with rubato, the score for the trio arrangement can be used by the musicians. The full orchestration of Gounod's March funèbre d'une marionette features the clarinet, bassoon, and oboe prominently, making this a natural for the reed trio. Originally written for two flutes and cello, Haydn's London Trios work well for reed trio. The brothers Johann and Josef Schrammel were prolific composers who originated the style of Viennese folk music known as Schammelmusik. Johann Schrammel's Wien Bleibt Wien! march is perhaps the most famous of his compositions. Alte Kameraden, or Old Commrades, is a German military march written around 1889 by Carl Teike. The pieces below are works written for reed trio that have been re-typeset to improve legibility and playability. Charles Huguenin's first trio for oboe, clarinet and bassoon, written in 1910. This edition avoids bad page turns and includes the key signature on each line. Pfeiffer's Musette typeset with measure numbers and rehearsal marks. If you would like to contact us, please use the form below. Your email address will be kept confidential. Human test: How many people are in a trio? Copyright © 2019 Willamette Reed Trio. All rights reserved.